Who Built The Ark? is a story, a silly song, AND a full-length animated video that tells the all-time classic Bible story of Noah. You can download the free app that will work with any mobile device, and then delight as your little ones watch and sing along with this original song! 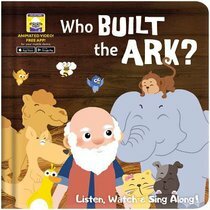 About "Who Built the Ark? - It's a Story, a Song and a Video All in One! (Downloadable App) (My First Video Book Series)"